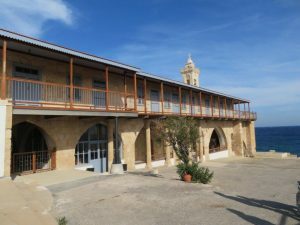 The Apostolos Andreas Monastery lies in the Karpaz, the rather deserted and naturally beautiful northern peninsula of Cyprus. Historic sources tell that the Apostle Andrew landed here for a moment on one of his travelings through the Mediterranean. Since very old times this place was considered as a holy place and visited by many pilgrims. However, christians were not the first people to visit the Karpaz; not only remnants from the Roman period were found, also from the far earlier Iron Age. 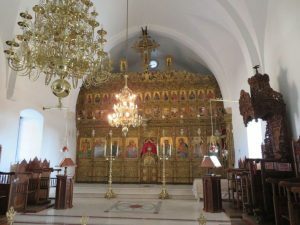 The actual Apostolos Andreas Monastery dates from 1867 and rest partly on walls of a 15th century chapel. The former cells for the monks lie empty around the complex that is guarded by one or two priests only. President Erdogan visited the region in 2011 and promised to cooperate for a UNDP project to renovate the church. Most of the work has already been done by a combination of Greek and Turkish Cypriots (or their companies), with nice results, worth a visit. Some adjacent buildings are still being restored. Since Turkey took hold of the northern part of the Island, there has been a lot of hustle and bustle around this holy place. For the restoration, cooperation of both the Greek and Turkish Cypriot community did not come just by itself: UNDP had a strong role in that. Anyway it is the Greek-Cypriot hope to get back not just the monastery but the whole Karpaz peninsula once that peace negotations have finally proven successful. And the Turks do what they always do in areas that might be disputed. 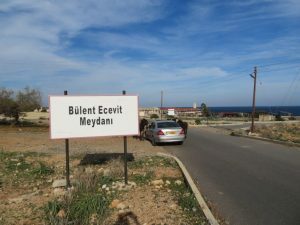 They keep investments low > the last part of the road to go to the monastery is the worst road of Northern Cyprus. And they show their power by calling the primary school of Dipkarpaz the ‘Recep Tayyip Erdogan School’ and the large square in front of the Apostolos Andreas Monastery the ‘Bülent Ecevit Square’; Ecevit was the Turkish Prime Minister in 1974 who decided to send the army into Cyprus to help the Turkish Cypriots. It is a strange pattern since over 40 years now of Greek Cypriots Always complaining as if they have no role whatsoever in what is happening, and the Turks showing muscles instead of empathy. 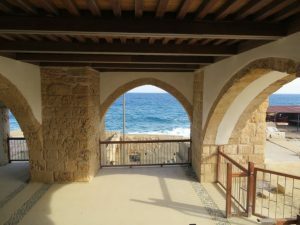 This entry was posted in Culture and diversity, Middle East cultures and history, Middle East politics and religion, Museums and heritage, Noord-Cyprus / Turks Cyprus, Zuid-Cyprus / Greek Cyprus by wordpressgrethe. Bookmark the permalink.